Ah, dinner with your family. The free food is nice, but it doesn't always make up for the conversation. 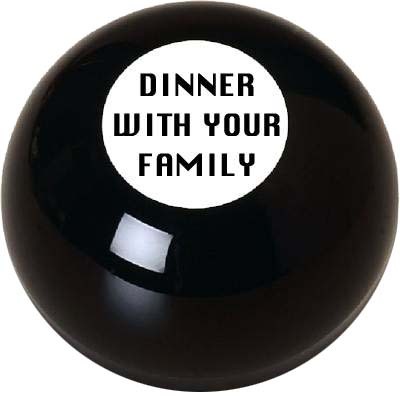 If you don't feel like schlepping over to your next family gathering, give the Magic Dinner With Your Family Ball a virtual shake. - Concentrate on your question. - Press here to see what your relatives have to say. Note: This project is in no way associated with the commercial Magic 8-Ball, its patent-holders, or my family. It's a parody. Please refer to Campbell v. Acuff-Rose Music, Inc, 510 US 569 (1994), et al., before filing any legal motions or telling my mom.